North Carolina has the best of both worlds with access to the freshest seafood, and the secrets of southern cuisine. The Queen’s City has a lot to offer when it comes to food. Here’s our list of the best restaurants in west Charlotte, North Carolina. On the 27th floor, visitors of Bentley’s are treated to a stunning view of Charlotte. Bentley’s is the place to go for a picturesque location, with a cuisine that is worthy of the surroundings. Head chef Jim Emad has been working in Charlotte for over 25 years and knows what works best in the area. The food at Bentley’s is American/French cuisine, and features dishes such as filet mignon and lamb chops. Look out for their escargot bourguignon, made with garlic, parsley, brandy, macadamia crust, and toast points. Davidson’s is the kind of place where couples or large groups can come and have a good time. Their cuisine is bar food with a little bit of a twist. They have a selection of tapas, such as the crispy pig ears, and the corn and jalapeño fritters. If you want to take it back to the basics, Davidson’s also serves salads and sandwiches. 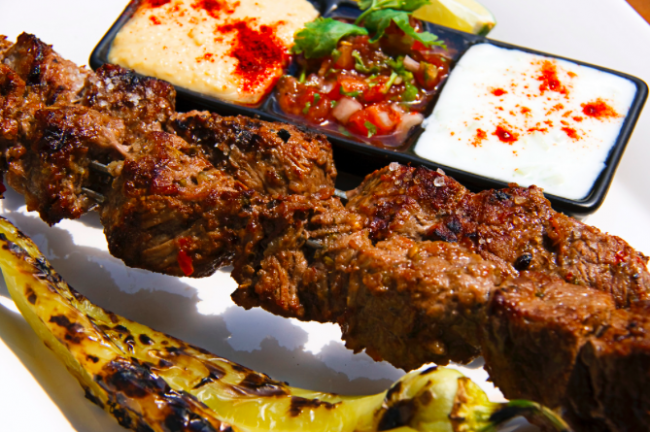 Look out for their Moroccan pork skewers, made with marinated pork, grilled grapes, cucumber yogurt, and grilled pita. Head chef Bruce Moffett aims to create a tapas style restaurant with Good Food. The menu is constantly changing, always using organic, local products. With its minimalist ambiance, good food, and good wine, Good Food is a great place to kick back and spend time with friends. Good Food offers cheese, salad, soups, pasta, and seafood. Look out for their extensive wine list, that acts as a perfect complement to their delicious food. While Salud Beer Shop started as a small store that promoted local beers, it expanded in size by adding hundreds of options for beer and a place for customers to get locally sourced food. The menu has delicious snack foods like nachos and pretzels, but they also offer neighborhood classics if you need something a little bit more substantial. An example of one of their salads is The Lindsey, served with spinach, sun-dried tomatoes, candied walnuts, avocado, and turkey with balsamic vinaigrette and vegan Japanese mayo. Look out for their phenomenal sandwiches served on fresh-baked Belgian waffles. Jasmine Grill serves fantastic Greek food. Options include kebabs, salads, falafels, and hummus. For meats, customers can choose between lamb, chicken, beef, or seafood. Mixed meat options are also available. The juices that they serve are all natural and come in flavors like blackberry, pineapple, mango, guava, strawberry, and jasmine. Look out for their mixed chicken, beef, and shrimp kebab, served with yellow rice and an extra side. Lola’s serves breakfast and lunch in a casual setting. Their options for breakfast are straightforward: eggs, French toast, bacon, and biscuits. For lunch, they serve quesadillas, hamburgers, hotdogs, and sandwiches. Every week day has a different special available, and all of them contain meat. Look out for their customizable omelets and burritos, for which customers pick all of their toppings. Viva Chicken can be counted on to serve tasty and wholesome food. All of the chicken that they serve is natural, free-range, and cooked fresh every 45 minutes, and their silverware is all biodegradable. They serve Peruvian food, such as their Inca wrap, made with canary beans, avocado, rice, salsa criolla, and a sun-dried tomato wrap. Look out for their signature juices, such as the Peruvian soft drinks Inca cola and chicha, and maracuya (passion fruit) juice. Bang Bang Burgers serves delicious burgers that are made out of high quality black Angus whole muscle cuts of short rib and chuck, and cooked to medium doneness. They have hilarious options such as ‘gangnam style’ – Korean style pork belly with a cilantro onion slaw, soy vinaigrette, and gochujang mayo. If you are not in the mood for a burger, Bang Bang has numerous sandwich and salad options for customers, as well as a black bean veggie burger for vegetarians. Look out for their cheeseburger egg roll, served with their special bangburger sauce. Little Village Grill is a great hole-in-the-wall spot in Charlotte that has great options for quickly served Greek or Mediterranean food. Options include gyros (with multiple meats), salads, and burgers. Servers are known for being attentive, friendly, and efficient with time. Their portions are large, but there is limited seating, so be sure to grab a spot outside on a nice night. Look out for their black bean burger.